The assessment identified specific gaps in service including: underserved geographic areas and age groups; the need for systemic solutions that involve youth and parents; an increased focus on prevention as well as intervention; and comprehensive engagement by all parties in fostering safe communities. The report further advocates for improved communication among all stakeholders, along with a unified vision for strategic and collective action. 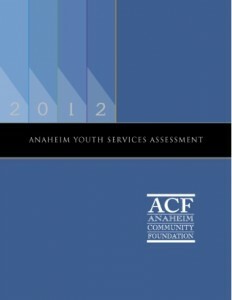 The final report will be released in print at a free public presentation at the Anaheim Convention Center on Monday, March 25, 2013 at 3:00 p.m. The full report will then be made available on the ACF website.